Adam Rippon (born November 11, 1989) is an American figure skater. He won the 2010 Four Continents Championships and the 2016 U.S. National Championships. Earlier in his career, he won the 2008 and 2009 World Junior Championships, the 2007–08 Junior Grand Prix Final, and the 2008 U.S junior national title. Rippon was selected to represent the United States at the 2018 Winter Olympics in Pyeongchang, South Korea. At the 2018 Winter Olympics, Rippon won a bronze medal as part of the figure skating team event, thus becoming the first openly gay U.S. male athlete to win a medal in a Winter Olympics. Later that year, he won season 26 of Dancing with the Stars with professional dancer Jenna Johnson, making Rippon the first openly gay celebrity to win the competition. Rippon announced his retirement from competitive figure skating in November 2018. 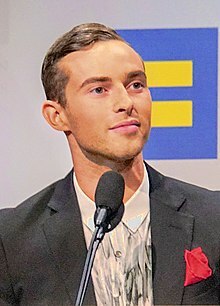 Adam Rippon was born on November 11, 1989, in Scranton, Pennsylvania. The eldest of six children, he was born with severe hearing loss but underwent surgery at Yale University just before his first birthday, allowing him to hear almost perfectly. His parents divorced in 2004. For jump abbreviations, see figure skating jumps. Rippon started to skate when he was ten years old; his mother skated and brought him along to the rink. He was coached by Yelena Sergeeva from 2000 to 2007. In the 2004–05 season, Rippon won the silver medal at the Novice level at the 2005 U.S. Championships. After Nationals he was assigned a spring international assignment, Triglav Trophy in Slovenia 2005, and competed in the Junior division, finishing first and winning the gold medal. In the 2005–06 season, he debuted on the ISU Junior Grand Prix circuit. He competed at the 2005–06 ISU Junior Grand Prix event in Croatia and placed 6th. At the 2006 U.S. Championships, he finished 11th at the junior level. In the 2006–07 season, Rippon did not compete on the Junior Grand Prix circuit. He placed 6th on the junior level at the 2007 U.S. Championships. Following the event, he left Sergeeva and began working with Nikolai Morozov in February 2007 at the Ice House in Hackensack, New Jersey. In the 2007–08 season, Rippon competed on the 2007–08 ISU Junior Grand Prix circuit. At his first event, the Harghita Cup in Miercurea Ciuc, Romania, he won the gold medal. He then won the silver medal at the Sofia Cup in Sofia, Bulgaria. These two medals qualified him for the ISU Junior Grand Prix Final. At that event, Rippon won the gold medal, and became the first man to break 200 points at a Junior level competition. He went on to the 2008 U.S. Championships, where he won the Junior title. The Professional Skaters Association recognized Rippon as having the best men's free skate at the National Championships and was awarded the EDI Award. He earned a trip to the 2008 Junior Worlds, where he won the gold medal after finishing first in both segments. Rippon moved up to the senior level in the 2008–09 season. In the Grand Prix season he was assigned to compete at the 2008 Skate America where he placed eighth and the 2008 Cup of Russia where he placed third in the short program and fifth overall. In late November 2008, Rippon left Morozov. In December 2008, he moved to Toronto, Ontario, Canada, to begin training with Brian Orser at the Toronto Cricket, Skating & Curling Club. Rippon officially announced his coaching change on January 2, 2009. 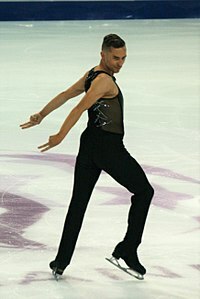 At the 2009 U.S. Championships, his senior-level national debut, he placed seventh. He was named to the team for the 2009 Junior World Championships. At Junior Worlds, in his two programs, he landed a total of three 3A jumps, one in combination with a 2T. He won the competition, scoring 222.00 points and becoming the first single skater to win two World Junior titles. Rippon sprained his ankle during the summer and missed some training time. For the 2009–10 season, Rippon was assigned to two Grand Prix events. At the 2009 Trophée Eric Bompard, he placed third in both segments of the competition and was awarded the bronze medal. At the 2009 NHK Trophy, he finished 6th after placing 8th in the short and 5th in the free. At the 2010 U.S. Championships, Rippon finished 5th overall after ranking 4th in both segments. He had a fall on his step sequence in the short program. Following the event, he was named as a second alternate for the 2010 Winter Olympics and 2010 World Championships, and assigned to the 2010 Four Continents Championships. At Four Continents, he placed 7th in the short program and first in the free skate, winning the gold medal. He was included in the U.S. team to Worlds after other skaters withdrew; he placed 7th in the short program, 5th in the free skate, and 6th overall. Rippon began his season at the Japan Open, where he finished ahead of Daisuke Takahashi and Evgeni Plushenko. His assigned Grand Prix events for the 2010–11 ISU Grand Prix season were the 2010 Skate Canada International and the 2010 Skate America. In Canada, Rippon had a collision with Patrick Chan during the morning practice before the short program but stated, "That was definitely the most exciting collision, maybe not the most dangerous." He won the bronze medal after placing third in the short and second in the free skate. At the 2010 Skate America, Rippon placed third in the short program, 7th in the free skate, and 4th overall. At the 2011 U.S. Championships, Rippon finished 5th and was assigned to the 2011 Four Continents Championships, where he had the same result. On June 16, 2011, Rippon announced he was leaving Canada and returning to train in the US at the Detroit Skating Club in Bloomfield Hills, Michigan, home of his DSC-based choreographer Pasquale Camerlengo and began training under the charge of Jason Dungjen. In the 2011–12 season, Rippon was assigned to 2011 Skate Canada and 2011 Trophée Eric Bompard as his Grand Prix events. He opened the season with a 4th-place finish at Skate Canada. This competition marked Rippon's first attempt at including a quad jump in his free program. At Trophée Bompard, he was 4th in the short program, 3rd in the long, and finished 4th overall. Rippon won the silver medal at the 2012 U.S. Championships. He finished 4th at Four Continents and 13th at Worlds. In September 2012, Rippon announced a coaching change, moving to train with Rafael Arutyunyan in Lake Arrowhead, California. At the 2012 Cup of China, Rippon collided with China's Song Nan – who sustained a concussion and withdrew – a minute into the final warm up before the free skate. Rippon said, "I kind of turned around to go into a jump and I think when Nan Song and I saw each other we both tried to avoid each other, but we went in the same way and we went head first into each other." Rippon finished 4th at the event and 8th at the 2012 NHK Trophy. At the 2013 U.S. Championships, he landed three triple Axels and finished 5th. He was assigned to the 2013 Four Continents but withdrew after sustaining an ankle injury on February 2, 2013. In October 2013, Rippon competed at the 2013 Skate America. He included a quad lutz in both his short and long programs. He set personal bests in both segments, capturing the silver medal and finishing as the top American over Max Aaron and Jason Brown. In November he competed for the NHK Trophy and posted a new ISU personal best in the short program 82.25. He landed a quad toe-loop in both segments and finished fourth overall. In October 2014, Rippon competed at the 2014 CS Finlandia Trophy finishing first in the free program and second overall. At the end of October he finished 7th in the free skate and 10th overall at the 2014 Skate Canada International. In November he finished 5th at the 2014 Trophee Eric Bompard after placing third in the free skate. It was a season plagued with equipment issues. Rippon adjusted his blade brand and mount, took on a new trainer to work with his team and met with renewed consistency at U.S. Championships, landing effortless triple axels and once again including a quad lutz in his short and long programs. He went on to win the free-skate portion of the competition and finished second overall with the silver medal. He was assigned to both the Four Continents team and the Worlds team. Rippon won gold at the 2016 U.S. Championships. He placed sixth at the 2016 World Championships in Boston with a lively program to a medley of Beatles tunes. The audience gave him a standing ovation. After taking bronze at the 2016 CS U.S. Classic, Rippon won bronze at both of his Grand Prix competitions – the 2016 Skate America and 2016 Trophée de France. As a result, he qualified for the first time to the Grand Prix Final. He would finish 6th at the event in Marseille, France. During an off-ice warmup on January 6, 2017, Rippon sprained his left ankle and fractured the fifth metatarsal bone in his left foot, resulting in his withdrawal from the 2017 U.S. Championships. Starting his season strong with a bronze medal at 2017 CS Finlandia Trophy, Rippon then went on to win silver medals in both of his Grand Prix assignments, 2017 NHK Trophy and 2017 Skate America. His placements at these events qualified him for his second Grand Prix Final. During his free skate at Skate America, Rippon fell on his shoulder while executing a quad lutz, but he was able to continue with his performance without stopping. At the 2018 U.S. Championships, Rippon placed 4th. On January 7, 2018, he was one of three men selected to represent USA in the 2018 Winter Olympics in Pyeongchang, South Korea. At the 2018 Winter Olympics, Rippon won a bronze medal in the figure skating team event as part of the U.S. team, which made him the United States’ first openly gay athlete to win a medal at any Winter Olympics. In November 2018 Rippon announced his retirement from competitive figure skating. On April 13, 2018, Rippon was announced as one of the celebrities who would compete on season 26 of Dancing with the Stars. His professional partner was Jenna Johnson. Rippon, along with Johnson, won the competition. Rippon's signature move is a 3Lz that he executes with both arms above his head, colloquially dubbed the "Rippon Lutz". He is capable of performing the 3Lz-2T-2Lo combination with one hand over his head in all three jumps (colloquially the "'Tano Lutz" after Brian Boitano, who invented the move). On October 2, 2015, Rippon publicly came out as gay. In February 2018, Rippon raised concerns about Vice President Mike Pence being chosen to lead the US delegation to the 2018 Winter Olympics opening ceremony because of Pence's history of support for anti-gay legislation and policies. In March 2018, Rippon appeared at the 90th Academy Awards red carpet wearing a harness designed by Moschino. At the Time 100 Gala, Rippon honored his mother, a single parent, for her inspiration and dedication to his success. He reminded people that success is not overnight: it requires dedication and the support of others. In addition to his mother, Kelly, he has a close relationship with his siblings. In 2019, Rippon guest hosted RuPaul's Drag Race Season 11 'Ruveal' livestreams with reigning queen from season 10, Aquaria. Rippon performs his short program to "Jonathan Livingston Seagull" at the 2010 World Figure Skating Championships. "Let Me Think About It"
"Because (The World is Round)"
"Are You Gonna Be My Girl"
"I'll Still be Diggin' On James Brown"
T = Team result; P = Personal result. Medals awarded for team result only. At team events, medals awarded for team results only. ISU personal bests highlighted in bold. ^ Both the 2017–2018 short program and an exhibition program from early 2017 are based on the same music composition, "Diamonds". However, the vocal performer and the choreography are different. ^ Rippon performed the song, but did not skate at the 2017 NHK Trophy gala exhibition. ^ Rippon performed the song, and skated to the original version of the song by Rihanna at the 2017 Grand Prix Final gala exhibition. ^ "Adam Rippon". Team USA. Retrieved January 8, 2018. ^ Note to Self: Adam Rippon reflects on "wild" journey, on and off the ice (Television production / YouTube). CBS This Morning. November 19, 2018. ^ Grinberg, Emanuella. "Gay athletes are making history at the 2018 Winter Olympics". CNN. Retrieved February 13, 2018. ^ Human Rights CampaignVerified account (January 27, 2009). "Human Rights Campaign on Twitter: 'Congrats to Adam Rippon (@AdaRipp), the first openly gay American athlete to medal at the Winter Olympics! đ&#x;‡şđ&#x;‡¸ đ&#x;Ľ‰ đ&#x;?łď¸?â€?đ&#x;Œˆâ€Ś '". Twitter. Retrieved February 12, 2018. ^ "Adam Rippon poised to be the next big star". lifeskate.com. September 26, 2010. Archived from the original on September 29, 2010. ^ a b c d e f g "Adam Rippon". IceNetwork.com. Archived from the original on August 27, 2016. ^ a b Mittan, Barry (December 11, 2007). "Rippon Rips Up Competition". SkateToday. Archived from the original on February 27, 2018. Retrieved August 8, 2011. ^ Lozano, Silvia (2010). "Adam Rippon: "If you can do it with one arm, why not two!". AbsoluteSkating.com. Retrieved December 22, 2010. ^ "Rippon ends professional relationship with Orser". IceNetwork. April 1, 2011. ^ a b c Mittan, Barry (April 12, 2008). "Adam Rippon: Now He Belongs". GoldenSkate.com. Retrieved December 22, 2010. ^ Staed, Becca (January 25, 2008). "Adam Rippon wins junior men's gold". IceNetwork.com. Retrieved December 22, 2010. ^ "Six Skaters Honored with PSA Edi Awards". U.S. Figure Skating. May 16, 2008. ^ "Adam Rippon: A Happy New Year Dawns". International Figure Skating. January 1, 2009. Archived from the original on January 10, 2009. Retrieved January 2, 2009. ^ "2008 World Junior Champion Adam Rippon Announces Coaching Change". U.S. Figure Skating. January 2, 2009. ^ "ISU World Junior Figure Skating Championships 2009, Day 3". International Skating Union. February 26, 2009. Archived from the original on March 12, 2012. Retrieved October 29, 2009. ^ Golinsky, Reut (2009). "Adam Rippon: "It's good to meet the challenge early in the season"". AbsoluteSkating.com. Retrieved December 22, 2010. ^ "2010 US Figure Skating Championships Championship Men Free Skate Judges' Details". U.S. Figure Skating. January 17, 2010. Archived from the original on January 20, 2010. Retrieved February 8, 2010. ^ a b c d Russell, Susan D. (September 7, 2011). "Adam Rippon Heads in a New Direction". IFS Magazine. Archived from the original on October 1, 2011. Retrieved September 8, 2011. ^ Brannen, Sarah S. (June 28, 2010). "Rippon to get romantic in upcoming season". IceNetwork. Retrieved December 22, 2010. ^ "Reynolds makes history, Chan stumbles at Skate Canada". TSN. The Canadian Press. October 29, 2010. Archived from the original on November 30, 2010. ^ "Adam Rippon Announces New Training Site, Names Coach". U.S. Figure Skating. June 15, 2011. Archived from the original on November 12, 2014. Retrieved November 12, 2014. ^ Kany, Klaus-Reinhold; Rutherford, Lynn (August 19, 2011). "Summer Notebook: Rockin' the ice in Detroit". IceNetwork. ^ "Rippon Announces Coaching Change". U.S. Figure Skating. September 11, 2012. ^ Rosewater, Amy (September 12, 2012). "Rippon chooses Arutunian for aggressive style". IceNetwork. ^ a b Flade, Tatjana (November 4, 2012). "Machida upsets Takahashi at 2012 Cup of China". Golden Skate. ^ "Machida stuns Takahashi in Cup of China triumph". IceNetwork. November 3, 2012. ^ Rutherford, Lynn (February 1, 2013). "Rippon likes training "up the mountain"". IceNetwork. ^ "Richard Dornbush Set to Compete at 2013 Four Continents Championships". U.S. Figure Skating. February 4, 2013. ^ "2013 Hilton HHonors Skate America". IceNetwork. October 2013. ^ "2015 World, Four Continents, World Junior Teams Announced" (Press release). U.S. Figure Skating. January 25, 2015. ^ Decool, Mélissa (January 25, 2016). "Veteran Rippon wins first U.S. National title". Golden Skate. ^ Cohen, Rachel (April 2, 2016). "Exhilarating performances for US men, but still no medals". New Jersey Herald. AP. ^ Penny, Brandon (March 30, 2016). "Adam Rippon, Max Aaron Perform With One Goal In Mind At Home-Ice World Championships". Team USA. ^ Rutherford, Lynn (January 9, 2017). "Broken foot ends Rippon's hopes for second title". IceNetwork.com. ^ "ISU Grand Prix of Figure Skating Final 2017/18". International Skating Union. December 1, 2017. ^ Rutherford, Lynn (November 25, 2017). "Chen falls to earth, still wins Skate America crown". IceNetwork. ^ "Winter Olympics: U.S. men's figure skating team set". USA Today. January 7, 2018. ^ "Adam Rippon becomes first openly gay U.S. athlete to qualify for Winter Olympics". Think Progress. January 7, 2018. ^ Natalie Stone; Karen Mizoguchi (May 21, 2018). "Dancing with the Stars: Athletes Crowns Adam Rippon as Its Season 26 Champion". people.com. Retrieved May 22, 2018. ^ Brannen, Sarah S.; Meekins, Drew (February 20, 2010). "Rippon talks Kim, Olympics and Four C's win". IceNetwork. Retrieved December 22, 2010. ^ Herrmann, Suzanne (November 14, 2010). "Adam Rippon: "I feel like I'm one of the luckiest skaters."". AbsoluteSkating.com. Retrieved December 22, 2010. ^ "Rippon comes out as gay in SKATING magazine". IceNetwork. October 2, 2015. ^ CNN, Veronica Stracqualursi,. "USA Today: Gay Olympic athlete turns down Pence meeting". CNN. Retrieved February 8, 2018. ^ Salam, Maya (March 4, 2018). "Olympian Adam Rippon Wore a Harness to the Oscars, Breaking the Mold". The New York Times. ISSN 0362-4331. Retrieved March 5, 2018. ^ Adam Rippon Honors His Mom & Nicole Kidman With Toast At The TIME 100 Gala (YouTube). Time. April 25, 2018. ^ "Adam RIPPON: 2017/2018". International Skating Union. ^ Rutherford, Lynn (August 24, 2017). "Champs Camp Chatter: Zhou gets new free skate; Chen sets aside outside distractions; Rippon marks 10th senior season". IceNetwork.com. ^ International Figure Skating Magazine (November 12, 2017). "2017 NHK Trophy gala exhibition line-up and music the skaters will perform to" (Facebook). ^ AbsoluteSkating [@absoluteskating] (December 10, 2017). "More ISU Grand Prix of Figure Skating Final 2017: Exhibition Gala Timing #GPFigure" (Tweet) – via Twitter. ^ Rutherford, Lynn (August 29, 2016). "Late-bloomer Rippon hopes to revive quad toe". IceNetwork.com. ^ Rutherford, Lynn (October 22, 2016). "Rippon debuts new free – with Arutunian's blessing". IceNetwork.com. ^ a b "2017 Stars on Ice: In Dreams Tour – Music". Stars on Ice. Archived from the original on April 14, 2017. Retrieved April 15, 2017. ^ Rippon, Adam (May 23, 2015). "So lucky to work with Tom Dickson on my short this year. Who Wants to Live Forever; #Queen!" (Instagram). ^ Rosewater, Amy (April 27, 2015). "Buttle brings 'revolutionary' style to choreography". IceNetwork. ^ Slater, Paula (August 5, 2015). "Adam Rippon lets go of 'doubt'". GoldenSkate. ^ "PROGRAMS". Adam Rippon Online. Archived from the original on November 22, 2015. ^ a b Vasilyeva, Nadia (December 4, 2015). "Adam Rippon: "I want to be young, current, edgy, and I wanna dive full into what I do this year"". Inside Skating. ^ "PROGRAMS". Adam Rippon Online. Archived from the original on October 6, 2015. ^ a b Capellazzi, Gina (April 20, 2016). "Stars on Ice: Wagner and Rippon balance touring and training". Figure Skaters Online. ^ Rippon, Adam [@Adaripp] (February 1, 2016). "A show program by Benji Schwimmer" (Tweet) – via Twitter. ^ Slater, Paula (October 30, 2014). "USA's Rippon buckles down for season". Golden Skate. ^ a b c "PROGRAMS". Adam Rippon Online. Archived from the original on February 19, 2016. Retrieved March 2, 2016. ^ Media Markt Eisgala 2014 – Roman Lob "After Tonight" Adam Rippon (YouTube). Spotlight Productions. February 13, 2015. ^ Rutherford, Lynn (May 23, 2012). "Rippon plans to skate like an absolute mad man". IceNetwork. ^ Oberstar, Molly [@mollyoberstar] (April 26, 2010). "@adaripp and i choreographin'" (Tweet) – via Twitter. ^ Elfman, Lois (May 6, 2010). "Rippon tries his hand at being a 'showstopper'". IceNetwork. ^ a b "PROGRAMS". Adam Rippon Online. Archived from the original on December 5, 2008. ^ a b c "Competition Results: Adam RIPPON". International Skating Union. Wikimedia Commons has media related to Adam Rippon.